Want to try yarn bombing but not sure where to start? Let us show you the ropes. Lots of crafters want to try yarn bombing, but don’t know how to begin. Some just need advice and a pep talk. Or maybe you already love to yarn bomb and just want to come play with us. Let’s empower each other to express ourselves through craft! 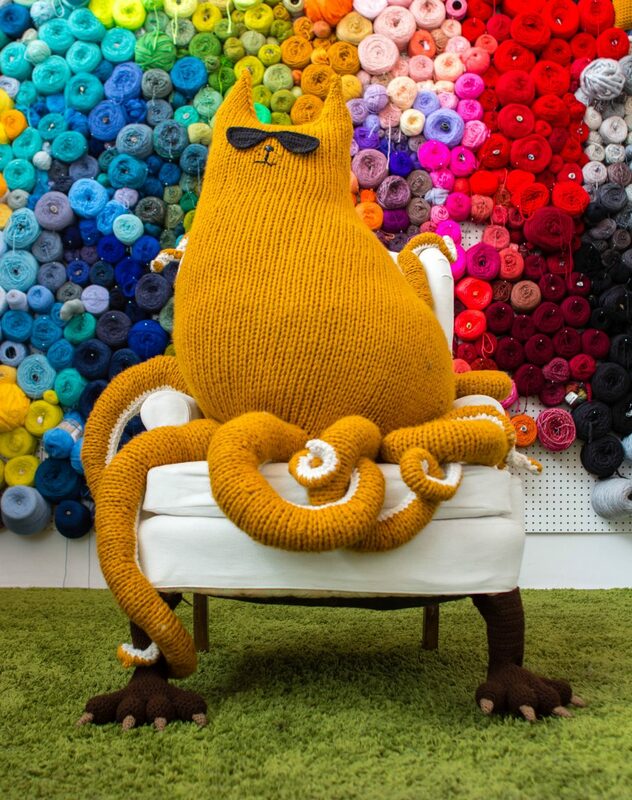 When you finish your Monster Feet, you’ll sew them somewhere silly and voilà, you’ll be a yarn bomber too! Scroll down to get each week in your inbox. The Monster Feet Yarn Bomb crochet pattern includes instructions to make three variations: feet, feet with claws, and feet with toenails. You can get creative with the rest of your yarn bomb like we did with the pink loop stitch. This design works great indoors as playful home decor, or outdoors as a surprising gift to your community. We’ll show you how to crochet legs to fit any size object, be it a pole, post, chair leg, or mailbox. We’ll host each week’s progress in a post on our site, linked below. Posts go live Saturdays at 8am U.S. East Coast time. Week 6 (June 9): Live Q&A, Install your yarn bomb! Follow along here as you work through the pattern. Each week is linked below. If you’re on Instagram, subscribe to the hashtag #MFYBAL. Already a newsletter subscriber? Check your inbox for the Yarn-Bomb-Along sign-up email. Not a newsletter subscriber? Subscribe here and be sure to check the box for the Yarn-Bomb-Along. There’s no limit to the number of participants. We are so excited to meet you all and watch these silly Monster Feet grow and stomp forth into the wild!